To state the obvious, becoming fluent in English will open doors and a myriad of options. Do you need more incentive than your own voice on the many instances per day when you’ve said to yourself: “I need to better my English”? For example, in a regular transaction, such as getting your drivers’ license, meeting with your children’s school principals, etc. Socially, also, it’s the go-to language that you use striking up a conversation at a hotel elevator with new people, ordering in a restaurant in an exotic city, or on top of a mountain with other random, international hikers. To drive the point home, though, English is the global de facto language of commerce. It can take you to new heights in your profession, add a portfolio of clients you didn’t have access to before, ease a relocation to another city in Florida where you may find more opportunities and also land you an international position in an NGO or a multinational company. FNU’s mission is to boost the predominantly Hispanic community it serves. 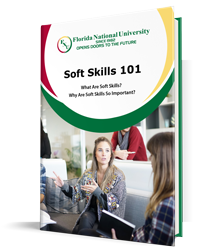 As you are probably aware, universities and continuing education classes are predominantly in English in the U.S. Generally, education, know-how, and dedication are highly prized across the board, whether it’s in the non-profit, public or private sector. English is indispensable. Following through on a full program, like FNU’s, sets a good personal precedence and is incredibly rewarding in many ways. Finishing our ESL program will, importantly, release that block you may have to attain a higher education. This will, in turn, release the block towards increasing your income and professional prospects. 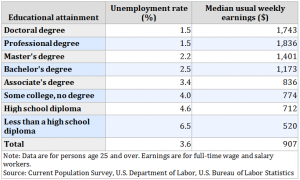 Below you’ll find a table directly from the U.S. Department of Labor regarding unemployment as well as the median weekly earnings in relation to education level. Once you know the FNU system and professors, it’s an easy transition into our bachelor’s degree or master’s programs. FNU has an established English as a Second Language (ESL) program, teaching classes every semester without fail that promotes students to upper levels. To determine your language level, FNU administers a placement exam on English-language vocabulary, reading comprehension and grammar. After successful completion of the four beginner-level classes, the university awards students a certificate. By the time you finish the certificate program, the goal for this level is for you to get a feel for the basic grammar for writing and speaking so that you can conduct all of your daily tasks with confidence. Moving on to higher aspirations, the next level, the ESL Intermediate Level Certificate Program, strengthens your understanding of the English sentence structure for the purposes of writing basic email correspondence and speaking fluidly in day-to-day conversations. FNU is regionally-accredited, which means the university met rigorous qualifications in order to be authorized to award degrees. Our undergrad and graduate programs are fully recognized, so you can be assured that your time, effort and credentials will be regarded very favorably. You’re motivated, you know you want to better English, but sometimes finances, schedules or commitment don’t mesh with your life. For the person with the super busy schedule, Florida National University (FNU) offers classes online. At any given moment we can have five online classes, in a whole range of levels to fit yours. Online Classes with FNU here. Don’t let finances hold you back. You’re reading this FNU blog post because you are convinced that you want to better your prospects and, for you, that means strengthening your English. Start by looking over our financial aid page, which has scholarships for government employees, military, high school graduates and more. 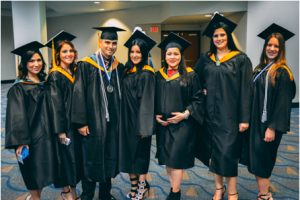 Our two major FNU campuses are conveniently located in Hialeah and South Miami, directly with a qualified ESL instructor and an encouraging environment of like-minded students with similar aims as yourself. There are many international students studying at FNU. If you’d like to get information about the international student club, please email internationalstudentclub@fnu.edu. If you’d like to see the application form and what documents FSU would require, register here and get follow the easy online steps.